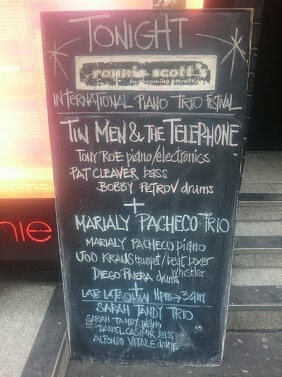 Last night’s double-bill at Ronnie Scott's was a rare occasion where the spirit of spontaneity went beyond the typical realms of standard jazz improvisation - and for both intended and unintended reasons. 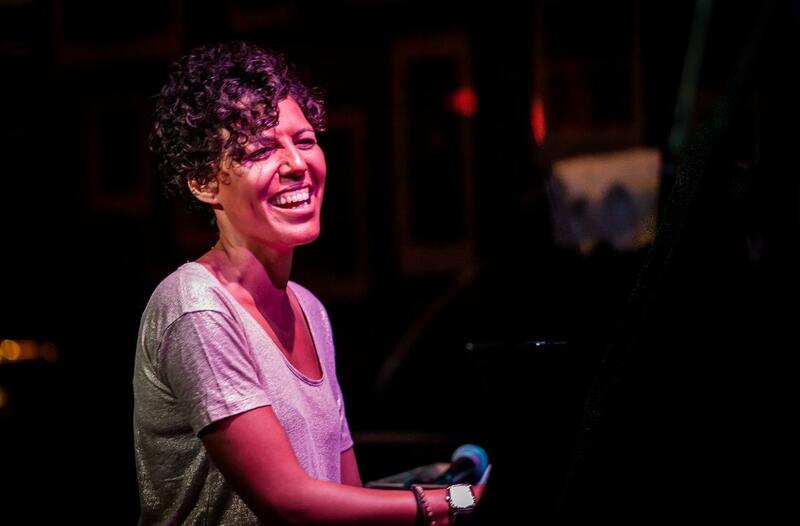 As part of a series entitled the International Piano Trio Festival, the Cuban-born virtuoso Marialy Pacheco performed the first set with her trio, while the avant-garde group Tin Men and the Telephone based in Holland, presented the second half. The music was memorable, fun, experimental and at times completely off-the-cuff. Pacheco seemed easy-going and relaxed, despite having to deal with a major issue. Her bass player, who was due to fly in from Colombia, never made the gig due to border control issues. Instead, as she explained to the audience, she was saved at the last minute by the guest appearance of accomplished German trumpeter Joo Kraus. With fellow countryman Diego Piñera on drums, her hastily assembled trio managed to perform a convincing set of original tunes and arrangements. Her music tended to be fast-paced, but varied in terms of styles. 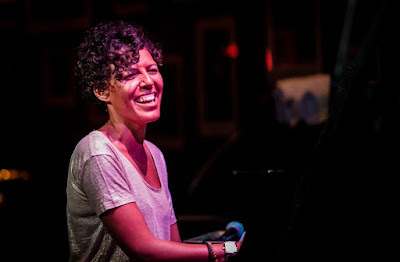 At times, Pacheco’s playing verged towards the classical, where she’d practically be playing Baroque counterpoint before morphing into a more swinging feel with walking bass in the left hand. At other times, her compositions would move into complicated rhythmic meters, with Piñera seamlessly going through different time-feels over the top. There was also an obvious Latin undercurrent to the whole set. Her most ballad-like piece, Tres Lindas Cubanas, was an arrangement of a traditional Cuban folk song from the 19th century. The romantic melody and legato chordal feel in her right hand was accompanied by a more staccato pattern in her left, bringing to mind couples dancing in the Havana moonlight. The band’s sense of spontaneity came to the forefront especially through Kraus. He more than compensated for the lack of bassist, not only playing trumpet but also vocalising the occasional bassline with his trumpet mic. He was also creative in a blues arrangement, where he whistled a spectacular solo complete with vibrato whilst miming playing with his hands. The final piece, Metro, was written through Pacheco’s 18-year old imagination of what a train would feel like, in a time when she had yet to leave Cuba and experience one. As the song built in tempo and the trio shouted words of encouragement to each other, it felt like the most energetic piece of the set, and a perfect way to bring it to an end. The second band of the evening were of a definite stylish aesthetic that jazz often lacks. With Amsterdam-born pianist Tony Roe in a bright yellow shirt, France via UK bass player Pat Cleaver in blue, and Bulgarian drummer Bobby Petrov in red, the primary colour visual aspect was complete with a projected screen behind the band. Before the set, listeners were instructed to download the free app Tinmendo on their smart phones, using a temporary Wifi set up by the club. The set was a mixture of humour and current affairs, with the first few tunes being musical adaptations to speeches from populist heads of state such as Kim Jong Un and Trump. The Hitchhiker’s Guide to the Galaxy-esque edge to the presentation drew laughter from the crowd. The audience were invited to choose on their phones which leader deserved to be ‘eliminated by the aliens’. There was a definite meme-like, viral video sense to the proceedings, as the band played along to a remixed video of Trump’s ‘build a wall’ speech. In a democratic turn of events, audience members were also encouraged to take part in the compositional process by making beats and melodies on their phones, which were then shared to and liberally interpreted by the band. Whilst the band’s main appeal was their ingenious interplay with technology, they were also extremely tight rhythmically. The trio had evidently practised syncing their playing to the screen, and made it seem almost natural. At times, it was hard to tell whether they were responding to the electronics, or if they were triggering them: Roe’s piano solo to a remixed tennis match was a case in point! It was fascinating to witness Petrov improvise a swing feel to a voicemail message, accompanied by a walking bassline from Cleaver, before easily slipping into hip hop grooves and the occasional disco beat. Roe and Cleaver were impressive in being able to jointly harmonize any crowd-sourced melody on the spot, even seemingly impossibly dissonant ones. Despite the focus on humour, Roe improvised a beautiful melodic accompaniment to an Erdogan speech, which was as sweet as it was exciting. Overall, this was a refreshing, forward-looking take on jazz improvisation. Tin Men use humour, politics, technology, and strong visuals to engage an audience. I found it a very convincing and compelling mixture.